« This is how happy Kila looks after homering. 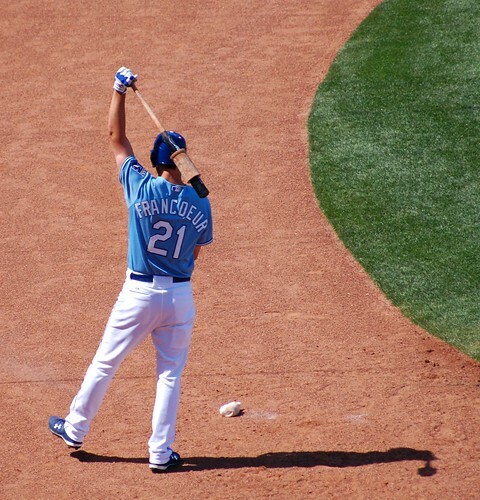 Two More Years of Frenchy….sigh. 1) This was not a trade; we did not lose any prospects. 2) It is one year. 3) More specifically, it is for 2011, which was going to be an ugly season anyway. Beyond that, I was ready to be livid if he was extended – or even if his one-year mutual option was exercised. The way I figured it when Frenchy was signed, smoke would be coming out of my ears today. But again, here’s a disgustingly positive numbered list. 1) Frenchy is actually having a decent season, his best in years. He has already out-earned his $2.5 million salary several times over, according to FanGraphs. 2) This is one that I keep forgetting – he is still only 27. It’s not ridiculous to think that he can be good for another 2.5ish WAR again in the next two seasons. 3) That arm. It doesn’t add a bunch of wins or anything, but it’s fun to watch. Fun is still important. 4) I do love MITCH, but he’s not the answer in right field every day, and he’s almost two full years older than Frenchy. 5) Most importantly, Frenchy is not blocking a bunch of right field prospects right now. I’m all about David Lough* (maybe to an unhealthy extent), but I was skeptical as to whether the Royals would give him a good shot anyway – and I’m still not sure what he would DO with that shot. So really, Frenchy is just keeping the throne warm until Wil Myers makes it up to the Majors. Somebody had to do that. *While we’re thinking about David Lough, have you seen his career BABIP? It’s been up and down and up and down and there’s really no way to know the extent to which luck on balls in play is contributing to his improved slash line this year. However, the two years when his BABIP was close to normal – .285 in 2008 and .307 last year – do correspond with his worst batting average, worst OBP, AND worst slugging percentages of his career. He’s doing well this year, with a .310/.359/.481 line, and a not-unreasonably-fluky .329 BABIP. So there’s that. From the Royals’ perspective, that “somebody” may as well be someone the casual fan is familiar with, somebody marketable, somebody who won’t cause trouble in the clubhouse or shoot any reporters or call his teammates a bunch of effing babies. Francoeur is marketable and well-liked, and even though contract details haven’t been released yet, we can be pretty sure he’ll be cheaper than Jose Guillen, for example, was. *I’m not saying roster decisions should be made based on the casual fan. But extending Francoeur was something that GMDM was likely to do anyway, and it doesn’t hurt that the Average Fan – who is awfully dumb but whose dollars are mighty important – really likes the guy. Wow, this post is ridiculously positive. Don’t get me wrong; I’m still not thrilled that we have two more years of Frenchy to look forward to. Why? His .329 OBP is one of the best of his career. Wait, that’s not good enough. Let me try again. That’s still not forgivable. 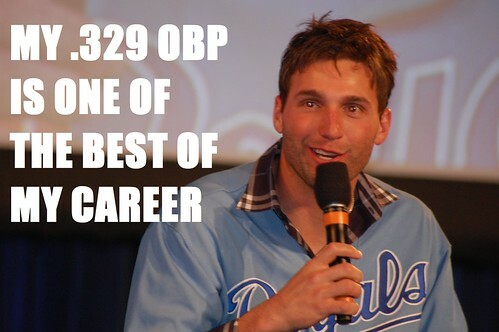 It’s a roughly average figure, and it is still one of the highest of Jeff Francoeur’s career. And we have two more years of that coming our way. Leadership, baby. Frenchy an All Star? No thanks. First of all, it’s great to see you back talking about the Royals! You’ve been missed this season. Second, it’s entirely possible that Frenchy doesn’t have a no-trade clause and could be dealt within the extended time. So we don’t necessarily have 2 full years with him. And third, like you pointed out, at least it’s not Jose Guillen. I’m late to the party here, but if you haven’t read Rany’s take on it you should. His feelings are exactly what mine were when I head about the deal, and he summarizes very well why this is bad for the Royals. And from me too: Welcome back!